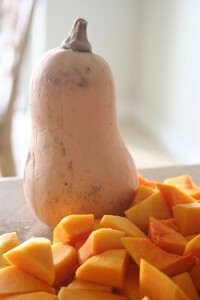 My new I’m-hooked-on veggie of the week is butternut squash! I’ve made a fabulous soup for Thanksgiving the past several years, but recently, I’ve begun to bake Bnut squash and I am lovin’ the taste and texture of it with this simpler preparation. rub the cubes or the slices with olive oil, sprinkle with salt and pepper, and lay out the pieces on a cookie sheet. bake at 375 for 20-ish minutes; turning them over at 10 minutes. The cubes can be then added to a casserole with legumes or grains, or tossed into a salad. The slices look gorgeous as a side dish, and are divine when taken out of the fridge the next day and snacked on like you’d eat an slice of an orange! Butternut squash provides an abundance of trace minerals and vitamins and has a delightful flavor. Enjoy!